Iain Young and Simon Maher, PhD students Rudi Verspoor, Vincent Keenan from IIB and colleagues from Q-technologies and FarmUrban spent an enjoyable weekend telling “fish tales” at the “Eat the Atlantic” Food Festival 4th and 5th of July. Eat the Atlantic was part of the Transatlantic 175 celebration commemorating 175 years since the first cruise liner crossed the Atlantic to Manhattan from Liverpool. Cruise liners, vintage vehicles and classic cars, catwalk models, dancers, bands, celebrity chefs, urban growers, about 500,000 visitors and even a few scientists from the IIB all gathered on Liverpool’s Historic Waterfront for the celebration. We took along some of our projects that we’ve been working on in partnership with collaborators from industry: AQUAMMS – an EU framework project in partnership with the University of Liverpool spin-out company Q-Technologies (http://q-technologies.co.uk) developing new miniature mass spectrometry based sensors for aquaculture (www.Aquamms.com), BiffiO – working with agriculture and aquaculture to look for new ways to gain value from their waste (www.BiFFiO.com), and various projects we have running with FarmUrban (www.FarmUrban.co.uk) focusing on sustainable urban food production. With its high efficiency pink LED grow lights reminiscent of an 80’s theme cocktail bar hovering over lush green plants, our “Vydrofarm” vertical nutrient-film hydroponics unit built for us by hydrogarden (www.hydrogarden.co.uk) was certainly eye-catching. 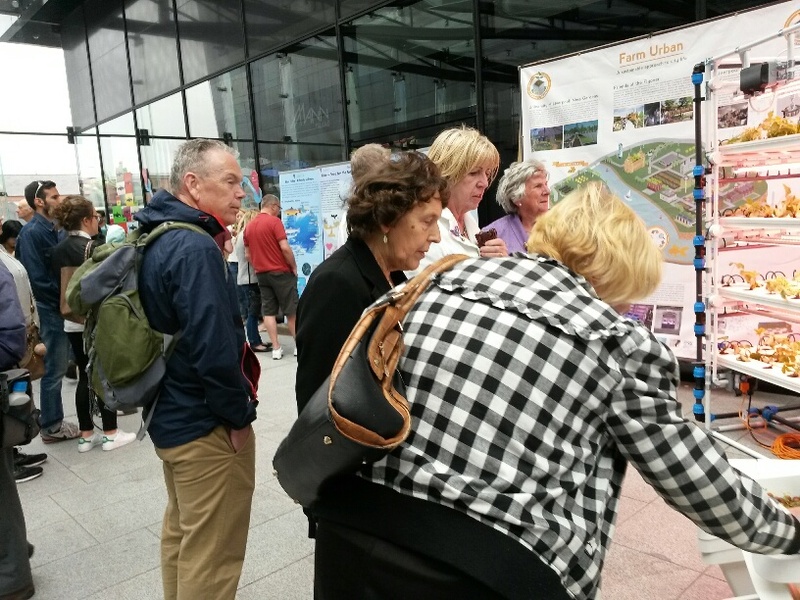 We soon became a crowd-puller in the atrium of the Mann Island Buildings (especially during Sunday’s downpours) attracting a lot of interest in aquaculture and urban farming.